One of the burdens that comes along with being a healer is the unenviable task of buff management. Druids have Mark of the Wild and can provide various buffs, depending on the form that they are in. Paladins spent the last two expansions dealing with the constant bickering about which blessing each person in the raid wanted and coordinating that effectively. Priests have Power Word: Fortitude and Shadow Protection. Shamans have a similar responsibility to paladins, in terms of coordinating which shaman will drop what totem and which one doesn’t stack with which existing raid buff and so on. Having people in your raid who are understanding and willing to communicate openly and amicably with you can certainly make this process much easier. Eventually, things changed and arcane was no longer the clear winner in the DPS race and was replaced by fire. Focus Magic was placed deep enough in the arcane tree where mages would not be able to spec fire and have enough points to reach down into the talent tree to take Focus Magic, too. Despite a few mages clinging tightly to their arcane talents, due to believing the difference in DPS not being enough to completely rule the spec out, Focus Magic soon began to fall out of favor and its presence all but disappeared from raids. – Warlocks of all specs have access to Dark Intent, contrary to the tooltip that states Metamorphosis (a Demonology talent) is a pre-requisite. – Only periodic damage or healing spells will trigger the effect. Direct healing spells or direct damage that crits will not. – Critical Periodic Damage can come from melee DPS, not just casters. – The effects of Dark Intent can stack up to 3 times and increases overall periodic damage and healing done, not just the chance to crit. So, warlocks have an amazing new buff to play with, that seems to appeal to a wider variety of classes and specs in the raid. This undoubtedly brings up a number of questions. Which classes or specs make the best choices to give Dark Intent to? Should warlocks get to choose who they give their buff to? Will Dark Intent really make that much of a difference in performance to make these questions relevant? Let’s find out! One of my guildies linked a terrific guide found on MMO that shows the results of some theorycrafting that shows who the top choices are to receive Dark Intent. The numbers are broken down, based on a number of criteria. The results are separated based on overall raid DPS gain, depending on which spec the warlock in question is and then based on personal DPS gain. The numbers showing personal DPS gain were not divided up, based on the warlock’s spec, because there was no difference in the results. Regardless of spec, for both raid and personal DPS gains, shadow priests were the top target for this buff, followed by balance druids, fire mages and feral druids. For raid DPS gains, typically a survival hunter would be your next best bet after that, regardless of the warlock’s spec. For personal DPS gains, a frost mage would be the next best choice, due to their high crit rating and the DoT from Frostfire Bolt. 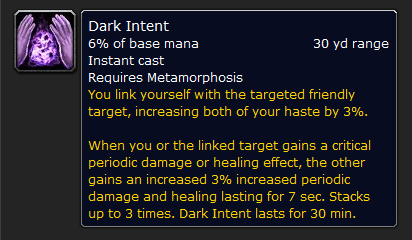 Interestingly, Dark Intent does not work to full capacity, when placed on another warlock. The haste stacks, but the stacked increase to periodic damage and healing does not. The two warlocks in question would receive 6% haste from each other and nothing else. Therefore, they and the raid stand to gain much more from Dark Intent by casting it on someone else. Since Dark Intent can also increase healing, there are situations where healers may make a better choice for the buff than DPS would. Resto druids are the clear winners here, followed by raid healing holy priests, resto shaman and then tank or single target healing holy priests. Discipline priests and holy paladins were found to be the least favorable healers to receive this buff, due to their minimal usage of heal over time effects (in the case of discipline priests) or the near absence of those effects (in the case of the holy paladins). The usage of Focus Magic was never something that was something that had to be controlled or watched over by an officer or anyone in charge in any guild I have ever been in. Most people would roll their eyes and sigh when they saw mages spam their Focus Magic macro in raid chat and would think nothing more of it. The truth of the matter is that the person giving the buff, be it a mage or a warlock, has a personal stake in who they give Dark Intent to. If they give it to someone who has periodic damage or healing capabilities, but is not geared for or does not have enough crit to support the stacks that come with it, nobody wins. They should have every right to make that call and decide who will give them and the raid the best bang for their buck. The only time that I feel an officer should intervene is if they see the warlock using poor judgment in who they give Dark Intent to. If you see a holy paladin receiving Dark Intent a half dozen times on a raid night, I would pull the warlock aside and give them a stern talking to. If you see warlocks taking bids on who gets the buff and not considering what is the best thing for themselves or the raid, I would put my foot down on that. Let the warlock use their best judgment, until you realize that maybe they aren’t. You betcha! Taking into account that the theorycrafting was done using Tier 11 BiS gear (iLevel 372), thousands of DPS could be at stake here. Thousands! Affliction warlocks giving Dark Intent to shadow priests led to the highest increase of raid DPS at 4131 DPS, followed by moonkin at 3462 DPS gained. Demonology warlocks posted the next highest increase in raid DPS by giving the buff to a shadow priest. 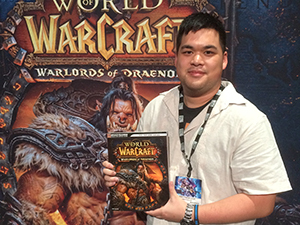 That combination led to an increase of 3270 raid DPS, with moonkin giving an increase of 2598 DPS. Destruction warlocks showed noticeably lower numbers, with the highest raid DPS increase being 3076 DPS, again working in tandem with a shadow priest. Each spec showed the highest personal DPS gain by working with a moonkin and showed an increase of 1999 DPS by doing so. The bottom line, which has become a motto of sorts for this expansion is “Every little bit helps.” If using Dark Intent at the right time and on the right person is going to increase your chances to kill a boss faster or to heal through something with less stress and mana usage involved, I’m all for it. I would not scoff at the increases you might see right now, just because they may not be as noticeable as the ones shown on the guide that I linked. Encourage your warlocks to do the right thing and encourage those they decide to give Dark Intent to to use it to it’s fullest. Having a buff that require two people to make the most of it only stands to increase the sense of teamwork and camaraderie that your raid as a whole should be experiencing towards each other. It was always my understanding that warlocks were all about Fear and Corruption. Who would have thought such a class could be responsible for such warm, fuzzy feelings? Any thoughts on how much it might help to start with it on a healer who’s pre-hotting a tank and switch it to your dps target as you run in? As a resto druid regularly running heroics with a guild lock, I’m <3'ing this buff, but understand that depending on gear it could better serve the raid to use it on a dps. I just know that rolling lifebloom between pulls is pretty regularly rolling the lock's stack of the damage buff, so I could imagine it would be noticeable to start the pull with full stacks and switch to your spriest buddy to keep them rolling. I would be inclined to think that such a thing might be possible. From what I found in my research, it’s an either/or proposition. If it’s a fight that requires you to beat an enrage timer or to be a DPS race, it should go to the DPS. If it’s more of a longer lasting survival fight, it should go to the healers or a combination of the two. Ultimately, it would be up to your warlocks to decide if they want to go that route. The spell doesn’t appear to have a cooldown, so your idea is totally possible. I would suggest not switching it up any more than that first time, though. Our Warlocks have decided to go with putting Dark Intent on Restoration Druids, which I am of course personally enthused by. I pre-HoT the tanks and often have at least 2 stacks of Dark Intent up. We see significant uptime given how many HoTs a Druid is putting out with WG. Our guild isn’t struggling with the DPS requirements to get bosses down so it feels like a good move to buff healers. Specifically mentioning your bit on who makes the decision, one of the things I’ve noticed is that allowing the people in my guild the power to make their own decisions in things like this seems to go a long way. It’s nice to not have to watch them like a hawk, but even better to see that they’re taking it seriously and that they use even little opportunities like these as a chance to show that they’re invested in the best interest of the raid. I agree and I also think it should be up to the warlock to do their homework and realize which person is going to help them, too. I think the warlock should be a little selfish in wanting to choose someone who buffs them the most and as it so happens, buffs the raid. As I mentioned, if said warlock is really dropping the ball and either not understanding how to get the most mileage out of the buff or flat out refusing to do so, then I feel it’s perfectly fine for an officer or lead to step in and show them some better alternatives or ways to use it. Generally, I let my guys come to their own conclusions about this type of stuff. They’re all bright and they do their homework most of the time. However, with that said, there are times when the raid leader or GM will pull rank and specifically ask for a buff to be placed on a certain player. Those times come far and few in between and I haven’t had to exercise it except for those moments where I completely ran out of ideas and started juggling players, buffs, and assorted combinations. I’ve put my Dark Intent on the holy pally throughout a raid before. It was mostly because I asked the healers at the time — a disc priest, a pally, and resto shaman — who would like the 3% haste, because none of them are really going to proc things for me and vice versa. The holy pally was tank-healing and maybe we all were a bit undergeared for it, but it seemed to help some. When it’s either a DPS race or not a healing-heavy fight, I switch it off to a DPS, preferably our shadow priest. For example, I’ll try to get it off onto a DPS during the Exposed Head of Magmaw (I forget a lot, though >.<). And then it goes back on the healer when the head comes up. ridiculous how much it'll proc off a spriest. I don't know how much I proc it for the priest, but it's near constant for what I get. And yes, @Wynn, that sound is totally annoying and wayyy too loud. I can't turn up my sound for boss mods and still hear Vent because of that stupid sound. The problem I’m having right now in my guild is that the warlocks and some of the other DPS are not convinced that the classes highlighted in the MMO guide and in that theorycrafting are the best choices to use it on right now. Our shadow priests have a 50/50 shot of getting Dark Intent and it’s touch and go if a resto druid ever gets it. The shadow priests are doing their own research to try to sell our warlocks on it and we’ll see if that wins over any hearts and minds. I do like the idea of swapping the targets. like you suggested. Giving it to a DPS during a burn phase and then back to a healer to help live through the fight. I can see a number of fights where that would be a really great way to go.